Scott McLaughlin on his way to breaking the lap record in practice Friday. 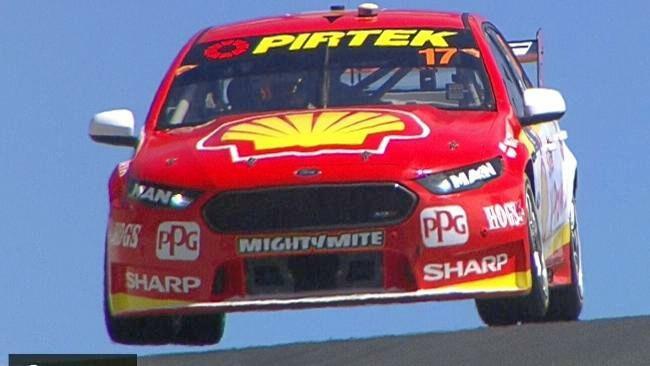 QUALIFYING ended with an anticlimax, but nobody was going to deny Scott McLaughlin provisional pole position for the Bathurst 1000. McLaughlin didn't quite manage to break into the 'threes' as forecast by his stunning practice laps when he broke the lap record, but a 2m04.22s was more than good enough to secure him the final run in Saturday's Top 10 Shootout. David Reynolds ended the session second fastest - but only barely. The session was red-flagged with less than a minute remaining after James Moffat crashed on the run into the Dipper, the fifth crash in the same spot across all categories so far this weekend. Moffat had been inside the top 10 at the time of his crash but was stripped of his fastest lap for causing the red flag, dropping him to 22nd place. Reynolds completed his lap fractions of a second before the session was stopped; had he crossed the line any later his time would not have counted. Fords filled most of the top 10 spots, with all six Falcons in the field qualifying for Saturday's Shootout. After Reynolds, you had to scan past Chaz Mostert, Sandown 500-winner Cameron Waters, Mark Winterbottom and Fabian Coulthard before you got to the next Holden. Shane van Gisbergen was seventh fastest - extending his streak of Shootout appearances to 31 - in a dire session for Triple Eight. Jamie Whincup just failed to make the top 10 and will line up from 11th on the grid on Sunday, surviving a high-speed trip through the sand at The Chase early in the session. Behind van Gisbergen was James Courtney, Jason Bright and Garth Tander, lucky last into the Shootout by dint of teammate Moffat's penalty. The best of the Nissans was Rick Kelly in 12th, one spot ahead of teammate Michael Caruso. Craig Lowndes will chase his seventh Bathurst 1000 victory from 19th on the grid, while reigning champion Will Davison could do no better than 16th after bending his suspension against the wall at Sulman Park and sitting out the closing minutes of the session.